The long awaited companion volume to Ian White's bestselling Australian Bush Flower Essences, first published in 1991 and still the authoritative book in the field. 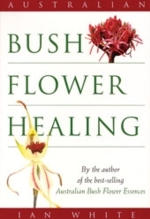 This second book, Australian Bush Flower Healing, covers the 12 Essences that were developed after his first book was published. This text is also fully illustrated and contains stunning photos of not only the new Bush Essence flowers, but also landscapes of the areas where they grow. One of the most valuable aspects of this book is the extensive repertory of emotional, mental and spiritual conditions. This index is a wonderful reference point when researching or selecting a Bush Essence. Ian White is a fifth-generation Australian herbalist, and has been practicing naturopathy and homoeopathy for over twenty years. Today his Australian Bush Flower Essence remedies are used and prescribed by healers, families, naturopaths and medical doctors. They are sold in pharmacies and health-food shops all over Australia and increasingly throughout the world. He regularly runs workshops in Australia, North and South America, Asia, England and Europe, as well as teaching at the major Australian naturopathic colleges.